I have to admit that February has taken me by surprise. January has passed so quickly, driven along by the usual contradictory post festive season mix of happiness, melancholy, confidence, self-doubt, gloom and optimism. Thankfully the current Scottish music scene can only encourage the latter feeling of optimism as musicians of all genres continue to contribute to what feels like something of a cultural high point. 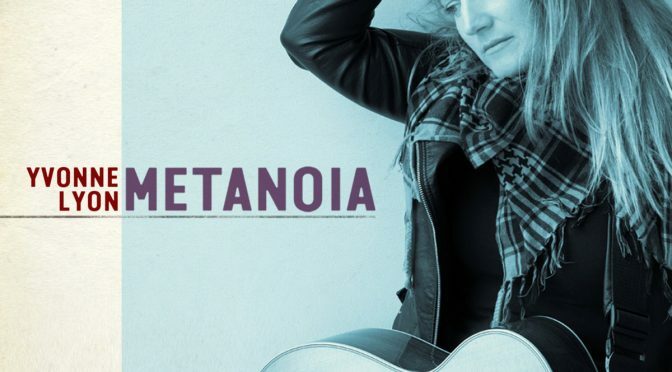 There has been a lot of new music delivered already this year but I make no apologies for breaking my silence in 2018 by taking a look at Yvonne Lyon’s latest work, Metanoia which was released in November of last year. It is an album that I have returned to repeatedly over the past month and it proved to be the perfect antidote to the January blues. The album’s title, Metanoia, comes from a Greek word which refers to the process of changing your outlook after a spiritual experience or period of reflection. With its mixture of new songs and older songs revisited Lyon has delivered a coherent collection which provides plenty of surprises as it runs its course. Opening track ‘Where the Poor Find Gold’ certainly grabs attention with its driving country-folk rhythm. It’s a strong start so it is good to say that what follows is even better. There are moments of reflection on tracks such as ‘Someday.’ The synths and beats of ‘Hope’ provide the perfect backdrop for Lyon’s dreamy vocal and is one of many highlights. There is real defiance here too on ‘Sweetest Freedom’, a anthem for those who believe the good guys will eventually win, no matter what is thrown at them. There is a strong case for saying that Yvonne Lyon saved the best for last when listening to closing track ‘Gigha.’ Situated just off the coast of Kintyre, Gigha is one of Scotland’s smaller inhabited Islands. It’s a place I have been lucky enough to observe many times during the ferry crossing to Islay from Kennacraig. Its familiar shoreline takes on many different guises depending on the weather, the state of the sea or the season. Yet with only piano, fiddle and that remarkable voice Yvonne Lyon manages to conjure up a wonderfully atmospheric picture of just what makes ‘Gods Island’ so special. Metanoia is one of those rare albums that rewards repeat listening with something new every time. You really can’t ask for more than that can you?